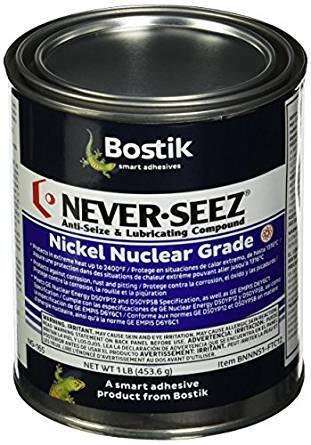 The standard in the nuclear industry, Never-Seez® Nickel Special, Nuclear Grade is specially tested and certified pure for use in nuclear power plants. 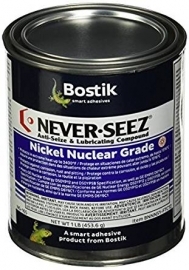 Each production lot of Never-Seez® Nuclear Grade is tested for contaminants of sulfur, halogens and low-melt metals and each container is labeled with the lot number that certifies purity. Recommended for nuclear fittings, valves and steam mani-folds. Provides maximum protection from high heat up to 2400°F and aggressive chemicals. Meets General Electric D50YP12, Westinghouse and Bectel's nuclear specifications. Tested to MIL-A-907. Fittings, fasteners exposed to high temperatures in steel mills, power plants and nuclear plants. Stainless steel pipe fittings, flanges, pump fittings. Fasteners in exhaust manifolds and boilers.